This is a comprehensive option agreement to buy real property - land or buildings - in a straight forward deal with no "bells and whistles". The price is fixed. The exercise date is fixed. There is no scope for argument. This is a straightforward "vanilla" option agreement to real property for a fixed price at a future date. There are no extensions or peripheral conditions, uplifts or other special features. The deal is simple. However, this version provides a high level of legal protection. It creates a full contract for sale and purchase subject only to exercise of the option by the buyer. As many points of law and conveyancing matters are covered as is reasonably practical so as to minimise the chance of conflict. If you are fearful that your buyer may be overwhelmed, then use a simple option agreement that contains fewer legal provisions. Using an option agreement to buy land or property for development allows a buyer to minimise risk, whilst at the same time providing the seller with a payment regardless of whether the buyer exercises the option. It can help incentivise a property owner to cooperate in securing the future event the buyer is seeking and, depending on the sale price agreed, let the buyer purchase at a discount to future market value. You can use this agreement on any occasion when you need to await some event. It could be simply development approval, or it could be resolution of a dispute, grant of a licence relevant to this land, or simply an offer of financing. This agreement can be used for securing an option on any type of land, and with a view to buying the property for any reason. We have other agreements for non-standard deals. 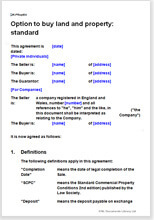 You can find our complete range of templates at: Property option agreements.